I'm not that much of an over-packer. That is, until it comes to beauty products. After all, those lipsticks and mascaras don't take up that much room, and a girl needs options. The only issue with toting so many products is packing makeup so it doesn't shatter during travel. Because, unfortunately, those compacts aren't always as sturdy as they seem. Arriving at your destination and opening your trusty powder foundation only to find it totally shattered? That's a pretty devastating way to start any vacation. So to prevent your powders from crumbling and your lip glosses from leaking, there are certain precautions you can take. 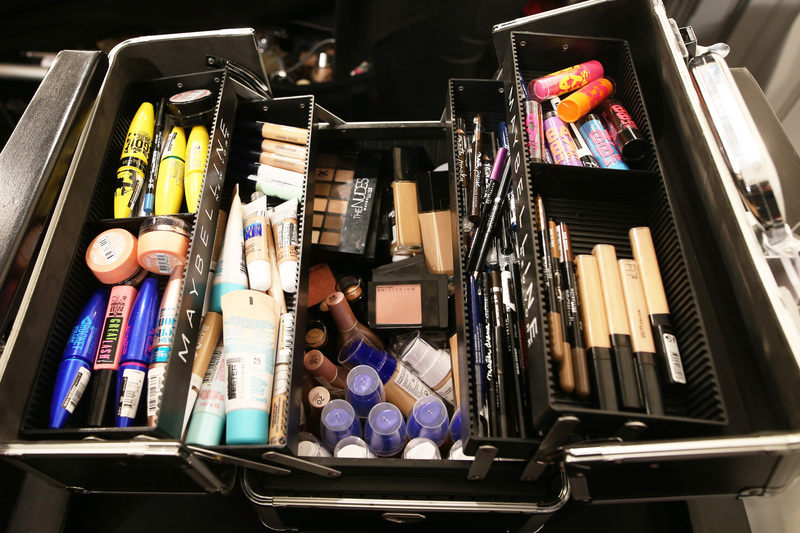 Before getting to how to pack each type of product to keep it safe, one of the best things you can do for your makeup is, if you're flying, to keep it in your carry-on. Suitcases can be bumped and thrown around, so keeping your more precious cargo in your control will help prevent your products from breaking. But even in a carry-on, you may still want to take some extra precautions, just in case. Before you take your next trip, here are seven ways to prevent your favorite bits from leaking, shattering, or otherwise wreaking havoc on your suitcase (and your heart) that you should know. For more fragile products like palettes, keep them from breaking or shattering by wrapping them in something protective like bubble wrap. If you don't have any on hand though or want to save space in your suitcase, you can also use towels or even the clothes you're already packing to wrap around your delicate beauty products. Pressed powders and shadows are so susceptible to breaking during travel. To make sure that doesn't happen, place a powder puff, cotton rounds, or cotton balls over the powder before closing the compact. The extra cushion will help prevent your powders from shattering should they bump into anything else. For products that could easily become leaky like glosses, concealers, and foundations, use rubber bands to secure the lid. Try to use thicker bands like the ones found around broccoli, and simply slide it length-wise around a tube or jar so that it helps press the lid or cap into the product. Liquids like cleansing oils, shampoo, and foundation may need extra insurance. Even if you secure the lid with a rubber band, it's always safer to also keep these products in an air-tight baggie like a Ziploc bag. This way, even if something leaks, it won't get all over your clothes. Loose powders can become messy during travel. To prevent powder from leaking out of their jars all over the rest of your stuff, apply tape over the sifters to keep every particle in check. For products that need to be kept secure but also need a little extra cushioning like nail polish, cling wrap is the way to go. Wrapping your products in a couple layers will help keep lids fastened while also providing another layer of protection so the bottle doesn't crack if it's bumped. It can be especially difficult to travel with products in glass jars like foundation and some skincare. Make travel more worry-free by transferring products that are housed in glass into smaller, plastic containers. Not only will this help prevent your products from shattering, but it will also save room in your suitcase.